The HEATKILLER® IV VGA series is the climax of 15 years of experience in designing and manufacturing high-performance water cooling equipment. Only the best features of the previous generations were merged together to provide an even more powerful water block. We continued the GPU cooling structure of the successful HEATKILLER® GPU-X³ series and enhanced it with the central flow design, already known from the HEATKILLER® GPU-X² series. Then, we did some improvements: the combination of an extremely fine microstructure right above the GPU and a reduced residual base thickness delivers an even better cooling performance. We also improved the overall flow rate by constructing all channels as wide as possible. All relevant secondary components, such as memory or voltage regulation modules are also directly cooled by the fluid. Preinstalled insulating spacers make contact to the PCB. Installation of the block is really simple and uses the stock backplate. The HEATKILLER® IV VGA series is manufactured from high-quality materials only: we only use highly purified electrolytic copper and the original PLEXIGLAS® GS from EVONIK for our products. All our products are completely manufactured on our own modern machinery park in our own workshop in Germany. In order to connect several HEATKILLER® IV VGA water blocks in a Crossfire setup, the GPU-X Dual-Link and GPU-X Multi-Link accessories are sold separately. There are two different possibilities to illuminate the block. We offer single color LED strips that connect directly to the card's onboard LED header (sold separately). But we also offer RGB LED strips that come with a black paracord sleeved cable that can be routed out of the block and can connect to both motherboard LED headers or third-party LED control units, hence integrating the card into existing illumination concepts. 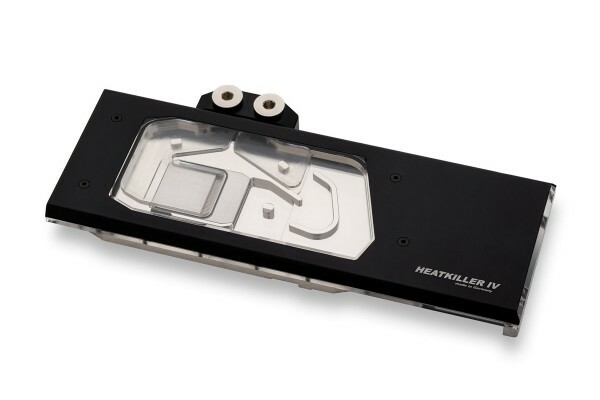 For information on compatibility, please refer to the compatibility list for HEATKILLER® VGA water blocks. Ist es egal von welchen anschluss das wasser rein geht ? sind 2 verschlusstopfen dabei ?